Dave Matthews: An Unlikely Rock Star At The Crossroads Dave Matthews Band is one of the most commercially successful rock groups in recent history. Here, Matthews reflects on his life in music after the release of the Grammy-nominated Big Whiskey and the GrooGrux King, as well as the death of one of his band's founding members. When Dave Matthews Band formed in the early 1990s, the group primarily provided entertainment at bars and for college students. Matthews met up with some talented musicians early on, and the group that formed around him developed a unique, jazzed-up take on the pop-rock band, which includes a violinist and saxophone player as core members. Nearly 20 years later, the group has won Grammys and has five No. 1 albums in its repertoire, making Dave Matthews Band one of the most commercially successful rock acts in recent history. 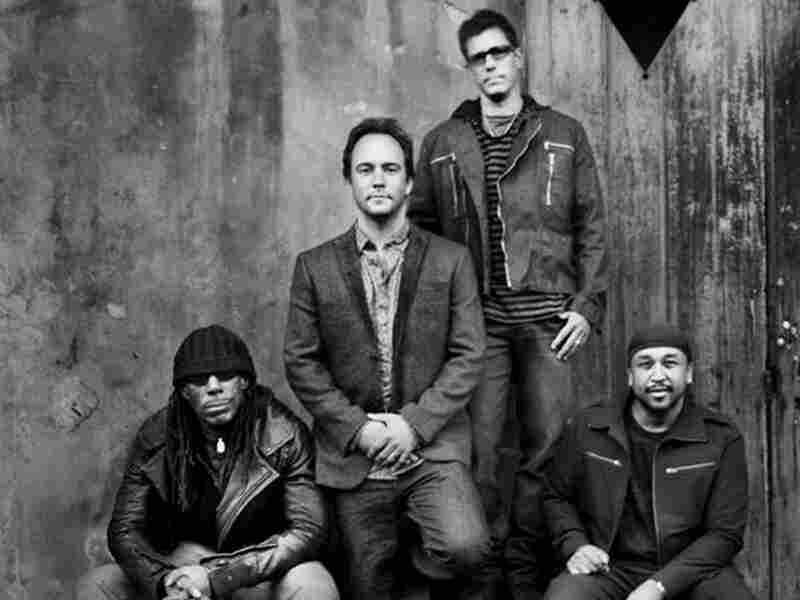 After all this time, members of the Dave Matthews Band are still close, onstage and off -- especially after the 2008 death of saxophonist LeRoi Moore. Moore had an accident while driving an all-terrain vehicle on his farm and later died of complications from his injuries. The title of the band's latest album, the Grammy-nominated Big Whiskey and the GrooGrux King, is an homage to the late musician. "It was a nickname," Matthews tells Weekend Edition Saturday host Scott Simon. "Friends and musicians, mainly, called him 'LeRoi Grux.' After he passed, I wanted to use 'GrooGrux' in the album title. The band all agreed it had a nice ring to it, and so we thought the 'GrooGrux King' was kind of nice." Dave Matthews Band has continued to make music and is touring heavily this summer with a new sax player: Jeff Coffin from Bela Fleck and the Flecktones. Nevertheless, Matthews says the band and the music have changed without Moore. "Definitely a big element of the sound that we make together came from him, and a spirit of how we play together -- a lot of that came from him," he says. "Funny the Way It Is" is a powerful, driving song from GrooGrux King, and Matthews' lyrics accomplish a gripping and unadorned style of storytelling. "It just states the obvious. Sometimes it's good to take the easy route," Matthews says. "That's a pop tune, boy, that's one of those pop songs." Matthews, who grew up partly during Apartheid in South Africa, says "stating the obvious" often communicates difficult subject matter most clearly. In the case of bigotry and racism in South Africa, he says, he felt better informed to confront those issues home in America. "When I came back to America, it opened my eyes to just how ingrained bigotry and fear are and how conformist we are here," Matthews says. "We pride ourselves in not being all those things, but it's really, in my opinion, a fight that you have to have against the nature inside of us to fear things that we don't know." Matthews says that success has given him an enormous forum to confront those forces through music. "I find a therapy in playing music, in many different ways," he says. "At this point, I'm incredibly grateful for the relationship that it has given me with the men I play music with -- I'm very grateful for that." Sometimes, however, it's the most guttural release that communicates best for Matthews. "Being able to scream at the top of my lungs in front of people is very therapeutic," he says. "It is a great gift for me to be able to do that."